Our most advanced CPR Call Blocker V10000 with a dual mode to block all Robocalls, Political Calls, Scam Calls, Energy Saving, Unwanted Calls on your landline. Block all nuisance calls at the touch of the BLOCK NOW button. Block Now - The Big Red Button! The ‘Block Now’ button is located on the top of the unit. At the touch of a button, the unwanted caller’s number is logged into the unit’s memory, the call will hang up and the number blocked permanently. This feature allows you to block up to 2000 unwanted calls. The V10000 can be set to block all numbers apart from the ones that have been preset on the Allow List. (#) 2 Blocking Function: Block a number by entering # 2 (Pound 2) on any cordless handset connected to the telephone base. Manual Entry: Manually enter or remove numbers to/from the Block List or the Allow List. Large Screen: Features a large easy to read 3" caller display screen. Easy To Use Controls: Large tactile button make it easy to control the Call Blocker. Call List: At the click of the CALL LIST button you can view the last 20 calls and if required you can add numbers to the Block List by pressing the BLOCK NOW button on that specific call record. Block List: At the click of the BLOCK LIST button you can view your full Block List and if required you can easily removed a number from the block list by pressing the DELETE button. Allow List:At the click of the ALLOW LIST button you can view your full Allow List and if required you can easily removed a number from the allow list by pressing the DELETE button. CPR Call Blocker V10000 has been pre-loaded with 10000 of the worst offending nuisance robocall numbers. 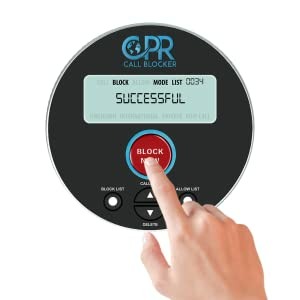 This helps provides a dramatic reduction in robocalls, scam calls, political calls, election calls and general nuisance calls as soon as the Call Blocker is connected. Private Blocking Function This will reject all calls shown as PRIVATE. Unknown Blocking Function This will reject all calls shown as UNKNOWN. International Blocking Function This will reject all calls shown as INTERNATIONAL. "0" Type Calls Blocking Function This will reject all calls shown as multiple 0s or variations of fake numbers. Last Calling Number Blocker This will block the last visible number. Protecting your loved ones has never been this easy. With the NEW Allow Mode you can set to block all numbers apart from the trusted ones. You can preset all the numbers that you want to receive calls from. All the other numbers will be automatically rejected. Quick & simple to Connect No mains power required (uses the power from your existing phone line). Compatible will all major USA landline providers, including AT&T, Verizon, Ooma, Charter, Comcast, Century Link, Frontier, Fairpoint, Windstream, Hawaiian Telcom, Cincinnati Bell etc. Compatible will all major landline phone manufacturers including, AT&T, Panasonic, Uniden, Motorola, VTech, Swissvoice, Gigaset, Philips etc. Note: Caller ID services from your network provider is required for this product to function. 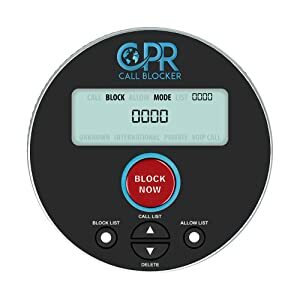 CPR Protect Landline Call Blocker - Block All Incoming Calls - Remote Program Trusted Phone Numbers - Designed To Safeguard Vulnerable Adults - Protect vunerable people and those living with Dementia or Alzheimer's.